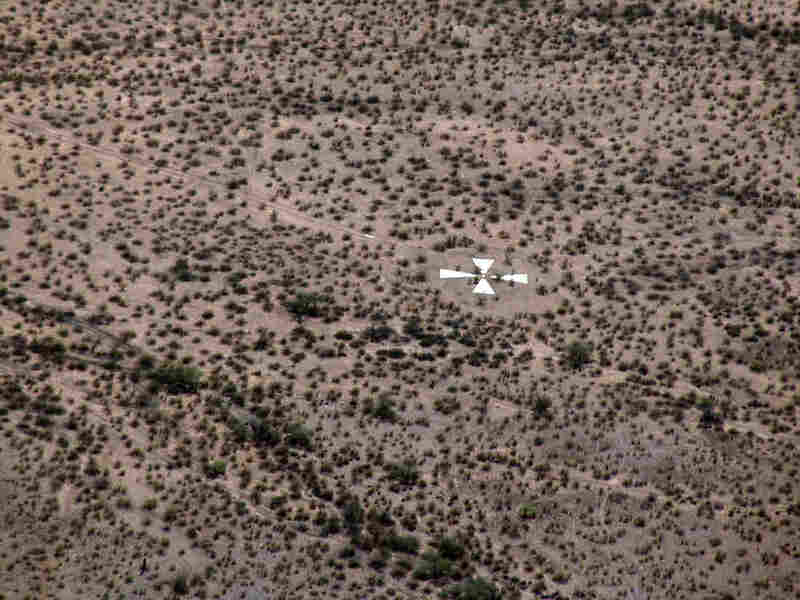 Pez Owen was joyriding in her Cessna airplane when she first spotted a giant X etched in the desert. “It’s not on the [flight] chart. There just wasn’t any indication of this huge cross,” she says. Pez Owen was flying over the desert in her single-engine Cessna airplane when she spotted a huge “X” etched in the desert below. She says it was the strangest thing. Chuck Penson is her former colleague from the University of Arizona. Penson worked in facilities, and Owen worked in the planetarium. Now, they’re adventure-seeking friends. That’s how Scott Craven from The Arizona Republic described them in a recent article. Their version of hanging out is exploring abandoned mineral mines and military radar bases. Mysterious X’s plotted in the desert was too good to pass up. “I was not going to rest until I knew what was going on with these,” Penson says. Each X is 60 feet across and consists of four 25-foot slabs of concrete, with a brass plate at the center. Chuck Penson captured these images while flying with Pez Owen in her plane. “You can see each of these [boxes] is one of the crosses,” she says. He counts 273 X’s on this map. Each marker is spaced about a mile apart. Pez Owen had flown her little plane over the edge of a massive 289-square-mile grid. 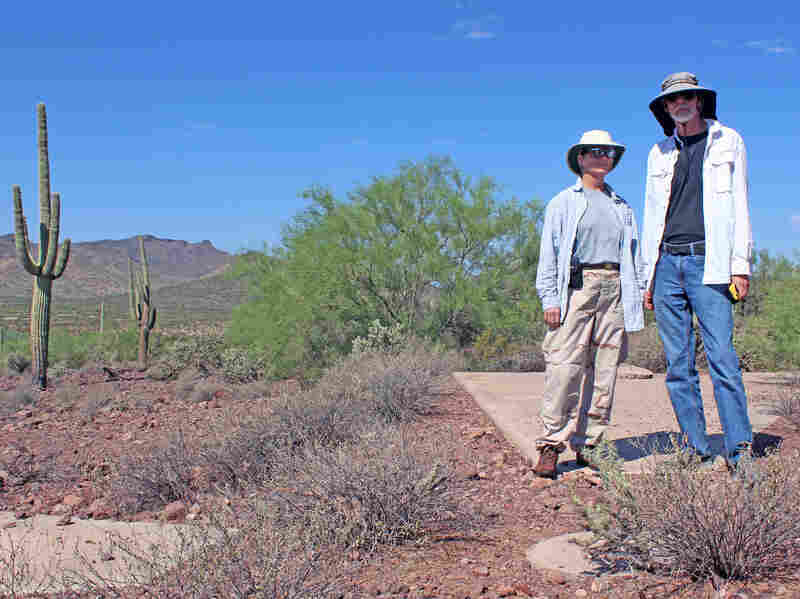 Owen (left) and Penson stand on marker “Y57,” located at the southwestern edge of a massive 289-square-mile grid of concrete X’s. They plot out a point and set off to search for an X. We’re way south of Phoenix when Penson’s GPS navigates the car right off the highway. We’re not driving on any road. We’re heading somewhere deep in the desert. “Middle of nowhere,” Penson says. That’s who Penson and Owen contacted to get their answer. These X’s were once part of a top-secret government program called CORONA — the nation’s first reconnaissance satellite program. The CORONA project is outlined in a declassified 1972 CIA film strip titled A Point in Time: The Corona Story.It’s filled with footage of men in lab coats in secret laboratories doing top-secret things. This is Cold War-era stuff. “All phases of the operation were performed under strict security,” says the narrator in the film. Spy photos were flooding in — but the pictures were blurry. That’s what the concrete X’s were for. That grid out in the Arizona desert was used to calibrate the cameras on board the satellites. 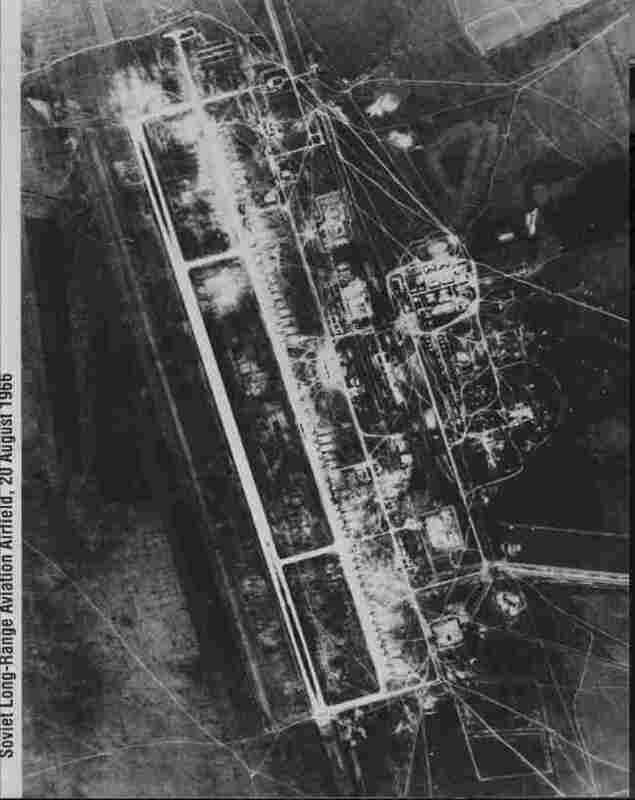 “[We saw] all their SAM sites, all their airfields, all their nuclear weapons testing and storage sites,” says Arthur Lundahl in the film. He was the director at the National Photographic Interpretation Center. 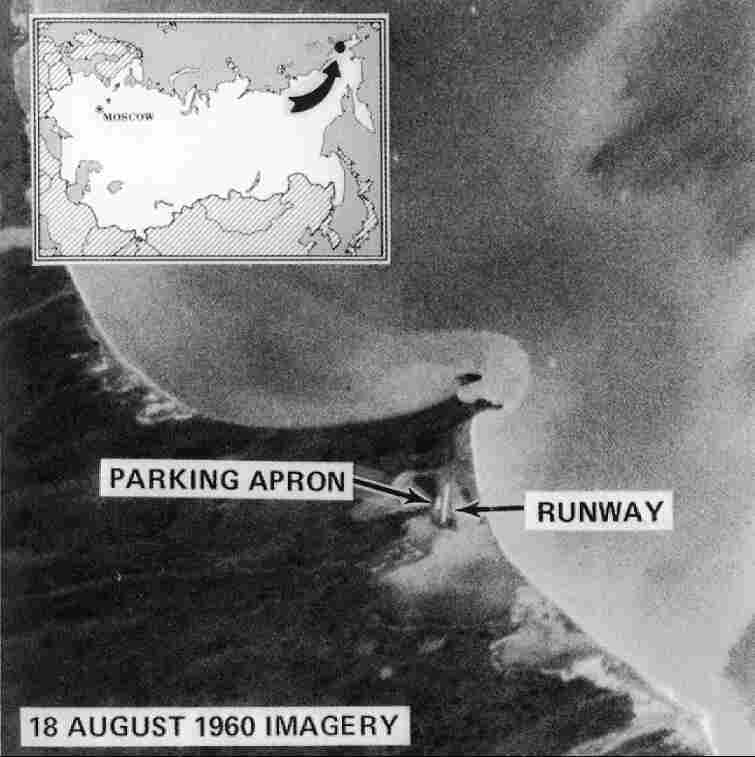 Over a span of 12 years, the CORONA satellites captured more than 800,000 images. That’s 2.1 million feet of film. “This [X] we’re standing on right now helped protect us from nuclear war,” Owen says. That’s when she made the connection. Her dad, Sid Owen, was part of the same top-secret program. “So he was actually working on the payloads for these satellites, and what the payloads were — were cameras,” Owen says. They were the same cameras that focused on the X’s. “I’m getting to know him better,” she says. Hang around Pez Owen and Chuck Penson for any amount of time, and they’re bound to tell you that you never know what you’ll come across in the desert. October 12, 2016 October 12, 2016 mannaismayaadventureDecades-Old Mystery Put To Rest: Why Are There X's In The Desert?